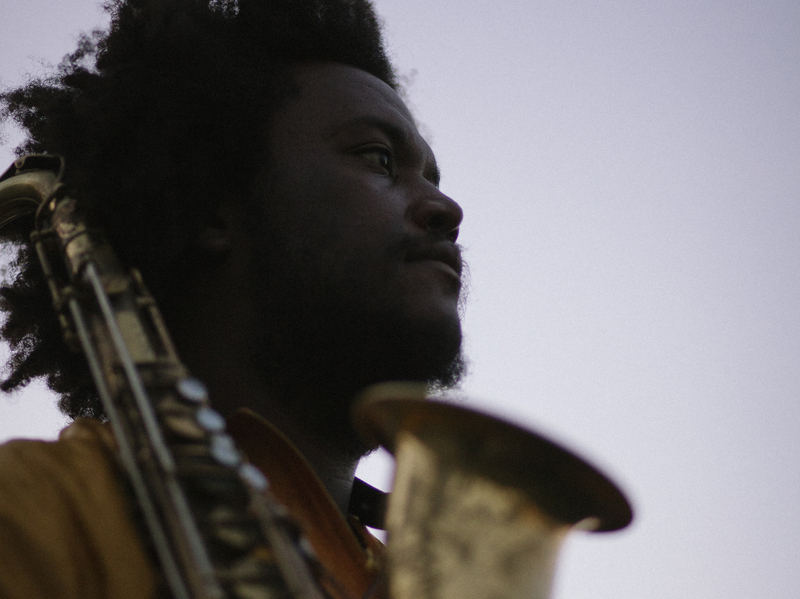 Interview: Kamasi Washington On 'The Epic' The Los Angeles jazz saxophonist ended up on the latest records by rapper Kendrick Lamar and electronic music producer Flying Lotus. His new three-CD recording is no less ambitious. Kamasi Washington's new album is called The Epic. When Kamasi Washington called his new album The Epic, he meant it. His band has two drummers, two bass players, both piano and keyboards. There are three horns and two lead vocals. There's a 20-piece choir and a 32-piece string section. Washington is a very plugged-in Los-Angeles-based saxophonist. He's played on two of the most important albums of the last year: rapper Kendrick Lamar's To Pimp A Butterfly and electronic musician Flying Lotus' You're Dead. As a matter of fact, Lotus owns Brainfeeder, the label that released this new three-CD, nearly three-hour collection. Kamasi Washington's core band is made up of friends who date back to (or sometimes before) high school. Together, they comprise the collective called The West Coast Get Down. Washington recently spoke with NPR's Arun Rath about the marathon recording sessions that led to The Epic, his interconnected dreams, and the lessons he's learned from hip-hop. So we all just decided to just take a month, and just not do anything else — we didn't take any other gigs, we didn't do any other tours. We had to tell everybody for a whole month, December 2011, and we just recorded everyone's music. So we were just in there crazy hours. We would get in at 10 in the morning and leave at 2 in the morning every day. We came out with a staggering amount of music. We came out with eight albums — eight different projects, I should say — 190 songs, like two terabytes worth of music. I personally walked away with 45 songs. We got to know each other. Even though some of us, we've been friends since [we were] 3 years old, I got to know them better than I probably ever intended, you know? I was working on this song called "Change of the Guard." I was working on that one for quite a while. And I don't know, something slipped into my subconscious. I'm really into anime and martial arts movies, so I started having this crazy dream about the change of the guard. This dream starts off with this guard who guards this gate. He doesn't do anything else — he just guards this gate. He doesn't have a house, family, anything — you can tell how solitary he is. And the gate is on the top of this huge mountain, and at the bottom of the mountain there's this village, and all they do is train to challenge this guard. These four villagers come up and challenge the guard. He sees something special in one of them and decides to let him beat him. It was deep — really, really wild, actually. That dream — I had that one five times in a row, something like that. I started to like it. I started to go to sleep with the hopes that I'd have that dream tonight, you know what I mean? What started happening was that other songs started creeping in there. After a while, I was dreaming about all 17 songs — they all had this connection to that story. It was this long, epic thing. ... That's why I call the album The Epic. I know it's big, but it was really The Epic in terms of the story. Kendrick, he's an amazingly talented guy. A really, really, really serious musician. He basically sat there — you know, there was crazy security, so I couldn't take the music with me, so I had to write in the studio. And he'd be sitting right there on the couch just watching, because he was just curious as to the process of how someone takes music from their head, puts it on paper, and then gives it to someone else, and they create music again, you know? So he was just sitting there watching, and I had a little keyboard in the room, and I was just writing all these parts out. After I would finish, he would say, 'OK, we should put this here and that there. Let's take this part and start it four bars later.' He was so hands-on. It was great, 'cause you don't get that a lot. A lot of times, people are just like, 'Do it,' and I'll see it when the album comes out. Sometimes [producer and saxophonist] Terrace [Martin] would bring in a new song, and I could see Kendrick just basically create a whole song instantaneously as he heard the music for the first time. I was like, 'Wow, man, you're a genius.' I was tripping out on that. I think L.A. has one of the most innovative and forward-thinking jazz scenes in the world. New York definitely has the volume — there's more music happening in New York than anywhere else. But to me, L.A. — it's kind of a gift and a curse. Because we're being overlooked, we've also been left to our devices. No one has their hands in the L.A. jazz scene that shouldn't have their hands in the L.A. jazz scene, you know? No one's pushing people this way or that way, or influencing them, making them do this or making them do that. Like, on the jazz level? We've always just done whatever we want to do. When we play our jazz gigs, no one can tell us anything. We only get to do it for the love, you know? We make our money somewhere else, so if you get us at Catalina's bar and grill [a Los Angeles jazz club], you're gonna get what we have in our hearts to give. I think that's important.